Liz McCall here. I self-identify as a board game junkie. We have quite a selection of vintage board games at the shop. But today I have a new game for you! It's kind of a cross between a logic puzzle and the board game Clue. 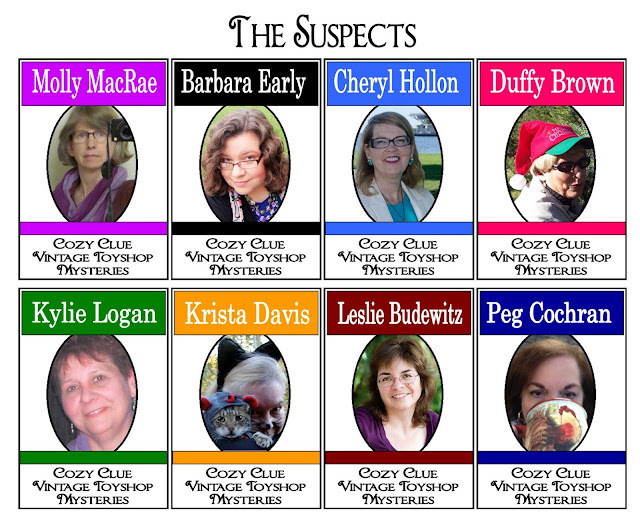 And the suspect are eight authors from the Killer Character blog! UPDATE: THE WINNERS HAVE BEEN CHOSEN, BUT YOU CAN PLAY JUST FOR FUN, IF YOU'D LIKE. WHEN YOU'RE DONE SUBMITTING YOUR ANSWERS, THE FORM WILL LET YOU KNOW HOW YOU DID. In addition, every player can make ONE free guess (suspect, weapon, and location) in the comments below at any time in the game. Leave an email in a safe format (ie. MyName AT myhost DOT com), and I'll email back the name of one of your items that's wrong, if any. You only get one guess, so use it wisely! When you think you've figured it out--or have eliminated enough possibilities that you'd like to "take a stab" at it--you can make your final accusation at this Google form. If for some freak techno reason you cannot access the form, you may email me at Barb AT BarbaraEarly DOT com, using the heading "final accusation" and be sure to tell me the suspect, weapon, and location. DO NOT post your final accusations in the comments. Five runners up will be chosen randomly from correct responses, and will each receive a Scrabble tile necklace. You may find this worksheet helpful. The killer's name doesn't contain a K.
None of the authors killed anyone in a location around which her series is set. Cheryl Hollon didn't kill anyone with a lawn dart. Peg Cochran didn't kill anyone in a yarn shop. Neither Barbara Early nor Leslie Budewitz killed anybody with a sharp object. Molly MacRae didn't kill anyone with an antique book or in a bike shop. Nobody died in a farm store. Barbara Early didn't kill anyone with an antique book or in a yarn shop. Nobody died on Wagtail Mountain. Leslie Budewitz didn't kill anyone with a soldering iron or in a glass shop. The only weapons that could be used in the B & B are the book and the lawn dart. Neither Molly MacRae nor Duffy Brown killed anyone with a flax hackle. If Peg Cochran killed anyone, it was in the farm store. Cheryl Hollon didn’t kill anyone with an athame or in a spice shop. If the killer used a soldering iron, it was in the yarn shop. If the killer used a halbard, it was in the spice shop. Duffy Brown didn't kill anyone with a soldering iron or in the yarn shop. If an antique book was used, it was in the spice shop. The murder didn't take place in a vintage toyshop. If the killer used a lawn dart, it was in the bike shop. Cheryl Hollon didn't kill anyone with a soldering iron. If the killer used an athame, it was in a yarn shop. Neither Molly MacRae nor Leslie Budewitz used a halbard. Neither Duffy Brown nor Cheryl Hollon killed anyone with an antique book. Remember, you make make ONE free guess in the comments below (include your email) at any time in the day, you may make one accusation here, and be sure to check back for more cozy clues! 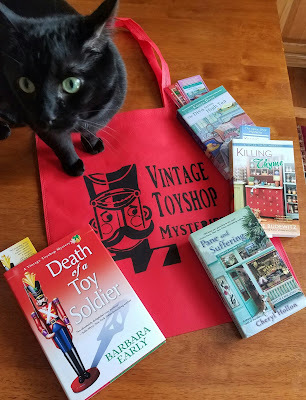 Death of a Toy Soldier, the first of the new Vintage Toyshop Mysteries, releases on October 11th from Crooked Lane. You can follow Barbara Early on Facebook to learn about more games and prizes in the twelve days leading up to the release! Don't miss the online release party on October 11th! You can find Death of a Toy Soldier on Amazon, Barnes and Noble, and through many other fine retailers. What fun! I'll have to check all the clues when I get home from work! Drat, got busy and missed it! What fun. This is much too chaotic a day to play, but it looks great. :( If I've piqued your interest, follow the link above to my online release day party. We'll be playing this game (and others) on that day, too. May your day become a little less chaotic! I hoped readers would enjoy it. Good luck! Next set is coming at noon! I too have an assistant that looks similar to your's. Check your inbox for your free clue! This is great! :) Here's my free guess... Leslie Budewitz in the bike shop with the antique book. Wow...great fun, but I'm missing some information. But for preliminary purposes...free guess. I think Duffy Brown with the lawn dart in the glass shop? I checked inbox and clue was not readable. Can it be resent? My free guess is: Leslie Budewitz in a bed & breakfast, with an antique book. Rats! I gave the wrong answer. And it is such a great prize! Well, good luck, everyone else! Judy, one guess per person, please! Yes please do post the correct answer! I will post the correct answer and the winners--as soon as every one who wants to has had a chance to play. Besides the grand prize, there are prizes for runners up chosen randomly from correct responses, so I want to give everyone a chance to get their answers in. I'm glad you liked the game! You're welcome Barbara, and thank you! I need an email, Val! Got it this time. Check your email! I'm down to three scenarios. I must have missed something! Ok. Since the game was over and I had two locations for one suspect and only one for the other, I submitted the one with only one possible weapon and location, but I don't see how I could eliminate the other person and her two locations. I'm late joining in and notice someone has already got it, but that's ok. I don't see where the correct answer is posted, so I went ahead and just submitted what I came up with. Thank you so much for the little brain workout! SO much fun! My mom was always doing logic puzzles when I was young, so I am going to send this to her. I think she'll get a kick out of it as she also loves cozies! Thanks again! Ha! Now I see the correct answer after submitting my guess! I was wrong, wrong, wrong. Maybe I read more into one clue then I should've as I eliminated that weapon option from that particular author. Oh well. Fun nevertheless! Yes, instead of posting the answer here, I reset the form so that it supplies the correct answer at the end. That way, people could continue to enjoy solving the puzzle. I'm so glad you all enjoyed it!